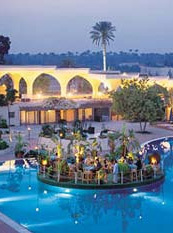 InterContinental Pyramids Park Resort Cairo is in an enviable location close to the region’s most amazing sights. You can reach the Great Sphinx, the Giza Pyramids, the Egyptian Museum, the Citadel and the Zoo at Giza in minutes. A little farther but also worthwhile are Khan el-Khalili, Egypt’s oldest market, and the Museum of Modern Egyptian Art. Strategically located in the heart of downtown. Classical hotel built in 1841, which offers comfortable accommodation. It features 259 A/C rooms with phone, TV and mini bar. Hotel facilities include selection of restaurants, bar, coffee shop, casino and banks. 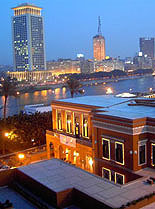 Situated in Saray El Gezira, Zamalek, it is one of Cairo’s best hotels on an island haven in the city centre. Includes 1250 rooms and a Palace on the Nile, where you can unwind and enjoy the royal Marriott service in an exquisite palatial setting. A beautiful mixture of ancient and modern comfortable accommodation. Enjoy 15 restaurants & bars, Omar Khayyam Casino, swimming pool & Splash Health Club. 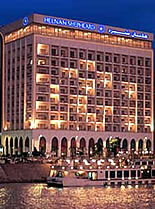 ERC, together with Cairo Marriott’s dedicated staff, are geared to meet your every need. A tour with English speaking guide to the Egyptian Museum - a place of discovery into the greatest collection of Egyptian antiquities and treasures including the precious jewels of young King Tut Enkh Amun. Half day excursion to the Great Pyramids of Cheops, the only surviving wonder of the ancient world, and the Pyramids of Chephren and Mycerinus fourth dynasty kings who ruled from 2589-2504BC. Also visit the most famous monuments of Ancient Egypt - The Great Sculpture Sphinx of Giza. Half day tour to Memphis which served as the capital of upper and lower Egypt some 5000 years ago during the first dynasty, and Sakkara one of the most exciting historical and archaeological areas in all of Egypt, featuring the stepped pyramid. with furniture of that time. Visit the Old Cairo site of the Hanging Church, the Church of Abu Serga where Jesus is said to have taken refuge. Then you will see the oldest mosque in Egypt & the Middle East which is Amro Ibn El ‘As mosque. You will conclude your tour with a -not to be missed- walk through Khan El Khalili bazaar. This spectacular one-hour narrative of Egypt’s ancient history in high fidelity stereophonic Sound & Light will enchant you. Be seated at the foot of the Sphinx with a breathtaking view of the Pyramids. Leave the hotel at around 8.00pm to witness the highest spot in Cairo (Cairo Tower) where you will enjoy seeing the attractions of Cairo while having your oriental dinner in the famous rotating restaurant. Then drive through Old Cairo to visit the colourful bazaars of Khan El Khalili. Cruise the Nile and see Cairo by night while enjoying superb entertainment including oriental music, whirling Durban and belly dancer. Morning departure to Wadi El Natroun via the desert road. Visit some of the oldest monastaries in Egypt and even in the history of Christianity such as El Sorian monastery. Back to Cairo (or continue to Alexandria). Transfer by private air-conditioned coach to Alexandria, the second largest city and first port in Egypt. See the Greco-Roman Museum - opened in 1895 and the red Aswan granite column of Pompey's Pillar which was erected in honour of the Emperor Diocletian. Continue your visit to the Catacombs which are an extensive three level funerary dating back from the 2nd century AD. Enjoy lunch at a first class restaurant. After lunch drive via the Corniche and its string of beaches to visit the royal Montazah Palaces & Gardens.